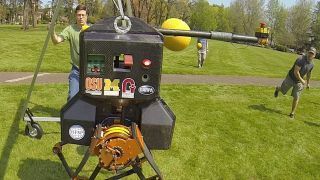 Roboticists at Oregon State University have successfully completed the first field test of a two-legged robot, which they hope could one day be able to run like a human. The robot, which stands about the same height as a person and is named 'ATRIAS', was able to keep its balance while taking a walk in a grassy field, up and down a hill. Humans tried to put it off by throwing a rubber ball at it, but it stayed up and crossed several different terrains at a walking speed of about three miles an hour. The robot has a much smaller battery than most others, thanks to an elastic leg design that mimics how animals move. "Animals with legs sort of flow in the energy used, in which retained kinetic energy is just nudged by very efficient muscles and tendons to continue the movement once it has begun," said Jonathan Hurst, who worked on the bot. "That's part of what's unique about ATRIAS -- not just that it can walk, and will eventually run -- but that it's doing so with animal-inspired fluidity of motion that is so efficient," Hurst said. "This will ultimately allow a much wider range of robotic uses and potential than something which requires larger amounts of energy." The robot did fall a couple of times due to sensor glitches, and was caught by a safety harness on a supporting frame that was walked alongside it, but overall the team was pleased with the results. "It already appears that ATRIAS is three times more energy-efficient than any other human-sized bipedal robots," added Christian Hubicki from OSU. "And this was the first time we've been able to show its abilities outside, in a far more challenging environment than anything in a laboratory." The work was funded by a $4.7 million, four-year grant from DARPA. Alongside the military applications it's hoped that the technology could one day have applications in developing prosthetics and exoskeletons for people with muscular weakness.